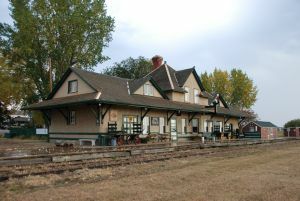 At one time, more than 800 communities in Alberta had a train station. This is no longer the case. 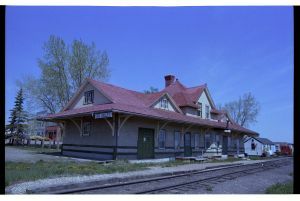 Fewer than 10% of Alberta's train stations remain today, and even fewer continue to serve their original purpose. 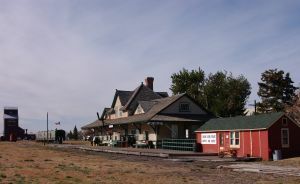 The Canadian Northern Railway Station at Big Valley - designated a Provincial Historical Resource in 2005 - is one of those few. Train excursions run regularly from Stettler to Big Valley, often with the mighty 6060 Steam Locomotive (also a Provincial Historic Resource) in the lead. The Big Valley CNoR station received a restoration grant from the Alberta Historical Resources Foundation this year, just in time for its 100th birthday. The Canadian Northern Society is planning a big party in honour of the centenary on Saturday, September 29. Check out the poster! Make sure your visit includes the roundhouse, which was designated along with the railway station. Another site worthy of note in Big Valley is St. Edmund's Anglican Church - the Blue Church at the top of the hill - which was designated a Provincial Historic Resource in 2002.